You will immediately feel at home in this holiday house in Ermelo. This charming house is ideal for 4 adults or 2 adults and up to 3 children. There is also an extra cot available for a baby. For children there are toys, books, a play mat, DVDs, a high chair and a Tripp Trapp high chair. The kids can amuse themselves while the adults enjoy their well-earned holiday. From the bed in the master bedroom you have a view of the garden through the French doors. This garden with a lot of privacy contains a conversation pit and is fully enclosed, so it is safe for the kids to play. The garden has lots of privacy, has a sunken sitting area and is completely fenced so children can play safely. There is a playhouse with swing and slide. 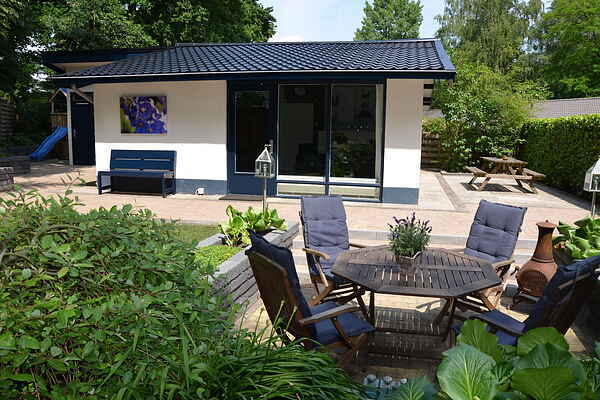 Thanks to the central location in the Netherlands, the house makes a perfect base for daytrips. Kids always look forward to a day at the Dolfinarium marine mammal park, the Apenheul primate park, Amersfoort Zoo, the Aviodrome, Walibi or the subtropical swimming pool Sypel with indoor and outdoor pool. In the area around the holiday house you will find forest, heath, sand barrens and Lake Veluwe. Hiking, cycling and water sport enthusiasts will be in their element here. There are also several nice sauna complexes in the area for a relaxing wellness experience. Here you can completely unwind.